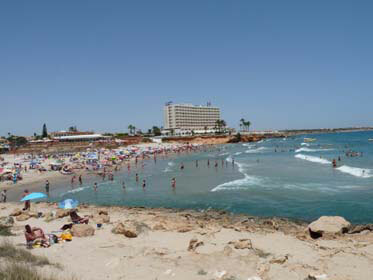 3 bedroom La Zenia property for sale by owner in the popular resort on the Costa Blanca, Spain. La Zenia Property: Featured is a fine 3 bedroomed family property available to buy direct from the owner in the lovely Orihuela Costa resort of La Zenia on the Costa Blanca, Spain. Currently being offered at a very reasonable price this excellent La Zenia property features 3 bedrooms, bathroom, en-suite shower room, lounge with fireplace, fully fitted independent kitchen, garage with possibility for 4th bedroom, terraces, tiled garden, communal swimming pool, secure gated community, solarium, cable TV, hot and cold air-conditioning.